Now that we’ve dealt with the basic format of an income statement it’s time to move on and show you how SharePad turns those numbers into really useful information. Knowing your way around an income statement is vital to understanding what makes a company tick. However, to get the most out of it you need to be able to crunch some numbers. These numbers are known as ratios and compare one number in the profit and loss account with another one. Ratios can tell you a great deal about a company. The most important thing to remember with ratios is that they are mostly meaningless in isolation. To have any use you have to compare them with previous years or with a similar or competitor company. 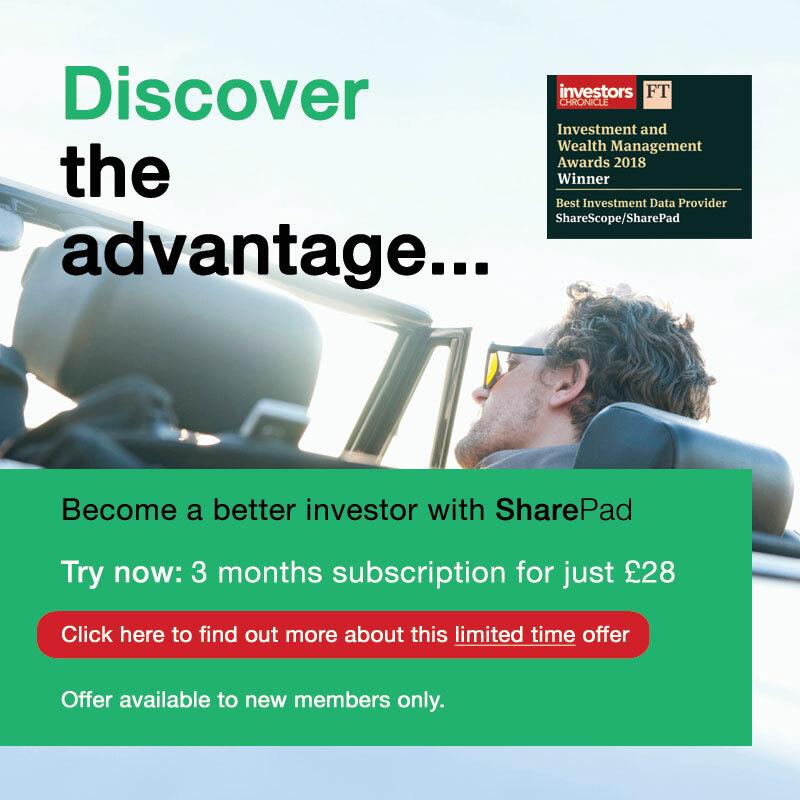 As with the balance sheet, you don’t have to spend hours collecting numbers and punching numbers into a spreadsheet or calculator, SharePad has done the hard work for you. If you want to, you can go back more than twenty years. This might be very useful if you say want to find out how a company performed during a recession or a boom. Profit margin tells you the amount of profit earned per £1 of sales expressed as a percentage. In the case of Tesco in 2014, its gross margin was 6.3%. This means that it made 6.3p of gross profit for every £1 of sales made. The most important thing to consider is the trend in the gross profit margin. Back in 2010 it was making 8.5p of gross profit for each £1 of sales. You need to start investigating why this has happened. That’s the great thing about ratios, they get you to ask questions about the company you are analysing and this can only help to make you a better investor. Just a quick point on gross profit margins. It may or may not be a useful ratio to calculate. Why do I say this? As I said in the previous chapter, it all depends on how a company decides to calculate its gross profit which is all down to what it classifies as the cost of goods sold. Different companies will have different approaches which comparisons between companies difficult. This shows the amount of operating/trading profit or EBIT a company has made as a percentage of turnover. I’ll concentrate on EBIT margins here as this is the measure that most professional investors will tend to pay the closest attention to and is therefore probably the most relevant to you. 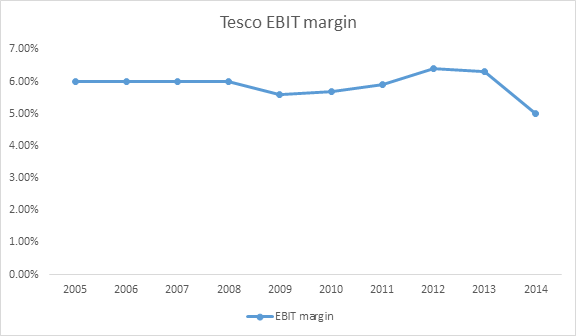 In 2014 Tesco’s EBIT margin was 5.0% down from 6.4% in 2012. Always look at the trend and you can see if the EBIT or operating margin has been on a downwards or upwards trend. Find out why this has been happening. Operating and EBIT margins are a much more useful ratio to compare companies with than gross margins. That’s because operating costs are likely to be calculated in the same way. What do profit margins tell us? Crunching numbers is all well and good but they have to be meaningful and increase our understanding of a company. You need to start thinking why the numbers are what they are. You might think that high profit margins (turning a large chunk of turnover into profit) is a good sign. Often it can be. However it might not always be the case. High profit margins may be a sign that a company is overcharging its customers. It may lose customers or attract new competition which will result in the company making less money in the future. Having said that, if you can find a company that has been earning consistently high profit margins for a long period of time (I’m talking ten years or more here) then you may have come across a very good company. It could be that the company has something – such as a brand or patent or cost advantage – that stops others competing with it. These are the types of company that legendary investor Warren Buffett likes to buy. On the other hand, you might think that low profit margins are a bad sign. Again, this might be the right conclusion to make but something else might be going on. For example, a company may be trying to break into a market by keeping its prices low and looking to make money by selling lots of goods (Amazon is a good example of this). Or a company may be spending a lot of money developing a new product but hasn’t started selling it yet. Another possibility is that profits are temporarily depressed and could be about to recover. The bottom line here is that numbers can tell you a lot but they don’t tell you the whole story. As well as crunching numbers in SharePad it’s probably a good idea to pay close attention to what the company’s management has said about the financial performance. You can find most of what you are looking for by searching for news items in SharePad under the “news” tab. What you’ll find is that different companies in different industries will have different profit margins. Comparing the profit margins of a food retailer with an engineering company will tell you something but may not be a meaningful comparison. It is best to compare companies in the same line of business. A company with very high debt (or borrowings) can be a big issue for shareholders. The reasoning for this is quite simple. Lenders get paid their interest before shareholders can be paid any dividends. The more interest on debt that has to be paid the more at risk your dividend payment tends to be. That’s why it’s a good idea to look at how easily a company can pay its interest bill out of its profits. You can do this by calculating a ratio known as interest cover. This looks at how many times a company’s EBIT (earnings before interest and tax) covers the interest bill. Generally speaking, the higher the level of interest cover, the better. 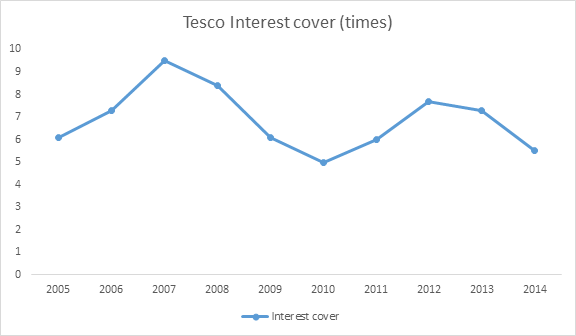 Based on its 2014 EBIT, Tesco had interest cover of 5.5 times which suggests that paying its lenders was not a problem. Low levels of interest cover might not mean that there is trouble ahead. Regulated utility companies – water, electricity and gas – can have interest cover ratios as low as 2-3 times because they finance themselves with a lot of debt. This is not necessarily a problem as their sales and profits don’t tend to fluctuate too much and so this level of interest cover should not automatically be a cause for concern. This is a new ratio we have added to SharePad. It is very underused by investors but is extremely useful in spotting companies that might get into trouble. It is similar to interest cover but takes into account the ability of a company to pay any rental expenses as well as interest on borrowings. Interest payments and rental expenses are known as fixed charges – they stay the same regardless of the level of turnover and have to be paid. Lots of companies decide to rent rather than own assets. Examples of this are retailers who rent their stores, train companies who rent access to tracks and stations and their rolling stock and trucking companies who rent warehouses and trucks. Because rental expenses (also known as operating leases) are deducted in the calculation of EBIT, you have to add them back to get the profits figure that is used to pay them and the interest on borrowings. Tesco has been selling a lot of its stores and renting them back (known as a sale and leaseback) over the last decade and has seen its rental expenses soar. 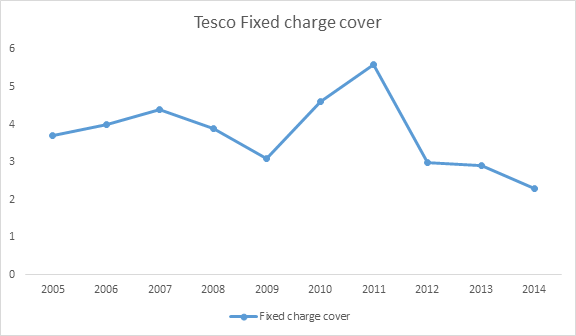 Its fixed charge cover in 2014 was just 2.3 times, but three years earlier it was a more healthy 5.6 times. This arguably shows a more stark deterioration in Tesco’s finances than the interest cover ratio does. Fixed charge cover would also you have spot trouble at retail companies such as Game Group or HMV in recent years. Both companies rented their high street stores rather than owned them. As their profits kept falling, the fixed charge cover fell towards just 1.0 times (in other words the rent and interest bills were barely covered by profits). This looks at how many times a company’s post tax profits (or earnings) cover the annual dividend paid to shareholders. It is used to give an indication of how likely it is that the existing dividend payment will be maintained – how safe it is. It is calculated by dividing the company’s earnings per share (EPS) by its dividend per share (DPS). You might be wondering which EPS figure SharePad uses to calculate dividend cover? It uses the fully diluted normalised continuous EPS (28.3p) as this is deemed to be the best measure of underlying profits to pay the dividend. In 2014, Tesco’s dividend cover was 1.9 times, indicating that its dividend per share of 14.8p was relatively safe. (It turned out that it wasn’t and I’ll explain why when we look at cash flow in Chapter 7). Clearly, the higher the dividend cover, the safer a dividend might appear to be. I’ll talk more about how you can use some other tools in SharePad to test dividend safety in a later chapter. If a company pays out a dividend per share which is greater than its earnings per share it is said to be paying an uncovered dividend. You might want to consider another way of looking at dividend cover. If you take the reciprocal of it (one divided by dividend cover) it will tell you what percentage of earnings is being paid out as a dividend – otherwise known as the dividend payout ratio. You can also just divide DPS by EPS. You can find this ratio calculated in SharePad. In Tesco’s case (1/1.9), the payout ratio in 2014 was 52.7%. Retention ratio = 1-Payout ratio. Tesco’s retention ratio in 2014 was 47.3% (1-52.7%).